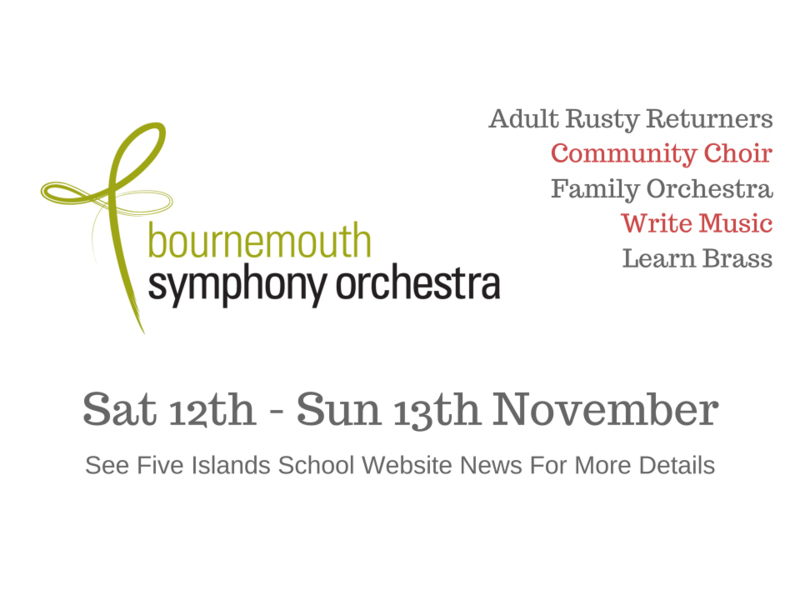 Patrick Bailey and Matthew Harrison, from the Bournemouth Symphony Orchestra, are returning for the weekend of 12th-13th November to run some more music sessions for the whole community. There are a number of different workshops on offer, and they are all free of charge. This group is open to any young people who are learning an instrument, or who play. Band musicians are very welcome. You will be working on writing/creating your own piece of music with Patrick and Matt. 2.30 – 4pm – Adult ‘rusty returners’ session. Did you used to play an instrument at school? Has it been in the case for over 20 years? This is a chance to start playing again and get some support and help in a very friendly environment. You will be able to use your newly found skills in the Family Orchestra session on Sunday, as well. This is an opportunity for all members of the community to come together to try some mixed voice singing. No age limits, no auditions, just come along and have some fun using your voice. 10.00 -11.00/11.00 –12.00 –Beginners’ Brass Workshops. These are sessions for all ages to come along and develop some basic brass skills. Both sessions are the same so just come along to the time that suits you best. This is a session for adults and children to make music together. We are using the term ‘orchestra’ in its widest form, meaning simply a large group of instruments playing together. The only rule is that if you bring a child along you have to stay and take part, so no unaccompanied children please! ANY instrument is welcome, and we have a limited number of amps available for electric guitars etc. If you do not play anything and your child wants to come, we can give you a percussion instrument to hit! This will be a fun, family session for the whole community to make music together. Music readers and non readers are welcome, and there will be parts that are accessible to all. All sessions will take place at school in either the music room or the performance hall. This is an opportunity for the whole community, so please invite your friends, family and neighbours. If you want any further information, please contact Debbie Wainwright on deborahwainwright@fiveislands.scilly.sch.uk or ring 424850 and leave a message. Alternatively you can message Debbie via the Five Islands School Music Department Facebook group.